Fifty climate activists packed onto a tour bus near the Energy Innovation Center in Uptown on Saturday. 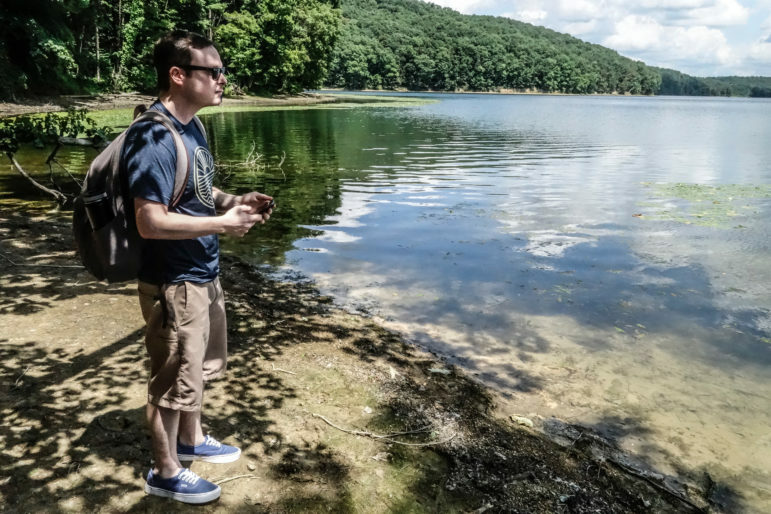 “I’d like to see us go on a fun trip somewhere,” Perry Recker, a member of the Pittsburgh chapter of the Climate Reality Project, had heard someone say at one of their recent climate change meetings. From that comment, they planned a tour. As if on cue, applause broke out when the last woman climbed aboard and the tour could start. Nine months ago, Al Gore, the founder of he Climate Reality Project, came to Pittsburgh and spoke to more than 1,000 activists. His talk energized the local chapter, and nine months later, it was time for a fun trip. What’s a fun trip for climate activists? The first stop: Valspar, a paint and coating company near Brighton Heights, which PennEnvironment has labeled one of the “Toxic Ten” for the amount of solvents like glycol ether that it releases in Allegheny County. The bus pulled up to a nondescript building with corrugated metal siding. Popovich's grandfather died in an industrial accident, he said, and two of his uncles died of chronic diseases from working in mills their whole lives. Popovich asked his doctor how much of his own heart disease could be attributed to living near a coke plant. His doctor said 20 to 40 percent of his disease was attributable to that. The next stop was a facility in McKees Rocks Bottoms that collected “fracking silica,” a sand used in the fracking process. Popovich had heard it was spewing into the air, leaking out of train cars and, one woman said, preventing her from going outside because of the threat of silicosis. “You don’t recover from silicosis. It’s like black lung disease,” Popovich said. "There is a small neighborhood with a playground right up against the fence. They don’t know what they don’t know." 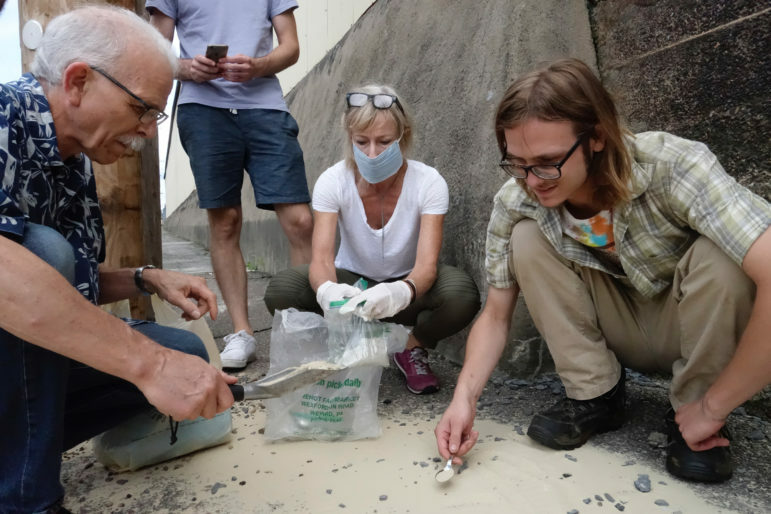 Several volunteers got out and carefully filled plastic bags with spoonfuls of sand that had spilled on the train tracks and blown onto the sidewalk. One woman wore a face mask. A professor at Duquesne University had promised to test the sand to see if the grains were small enough to get into the air and lungs. The activists stopped next near the piles of dirt that used to be the Shenango Coke Works, which was demolished earlier this year. The pollution used to be so bad neighbors had to keep their windows closed. "We used to protest here and hand out ‘Closed Window Awards' from Shenango. We made a big deal. We would march up to the gate and give them a closed window,” said Popovich. "We even had a priest bless the window once." The bus drove by chemical plants that, Popovich believed, were used to manufacture Agent Orange during the Vietnam War. The next stop was a salvage yard that burned off electrical wires from wrecked cars that could have been removed by hand. They passed a gas storage facility. Popovich explained that it fails to completely empty its used tanks and nearby houses can shake when the tanks explode. A renovated university athletic facility looked nice from the outside, he said, but “it’s just what you don’t know underneath” that causes harm: It used to be a toxic waste dump. “What’s that?” a passenger shouted, pointing at small plume of smoke rising from a nearby warehouse. The next stop was a scenic picnic lunch at a church next to the Ambridge Reservoir. “It’s pristine. No boating, no recreation, no fishing,” said Terrie Baumgardner, an activist who had become famous among environmental activists for raising questions about Shell’s new ethane cracker plant. The mood had shifted: no longer a Dickensian tour through the region’s industrial past, it now felt like a languorous Renoir painting—on the surface, at least. The reservoir is threatened by Shell’s new Falcon pipeline, Baumgardner said, which would run under the reservoir watershed and could contaminate it in a spill. 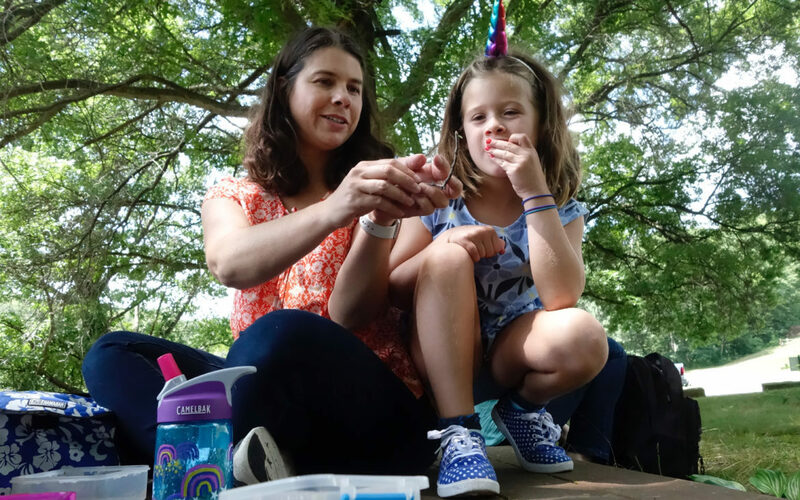 Phoebe Reese moved to Pittsburgh a year ago because her husband is working on a display for self-driving cars and, though she had done environmental work in the past, was on the trip to learn. “I didn’t know what the coke plant is or cracker plant,” she said. She said that previously, she thought coke just meant Coca-Cola, and crackers were something sold by Nabisco. After the picnic, the group set out for the most anxiously awaited stop on the tour: the construction site for Shell’s new cracker plant. The plant will emit around 2 million tons of greenhouse gases per year when it is fully functional. Coincidentally, Pittsburgh is trying to reduce its total greenhouse gas emissions by the same amount by 2050. 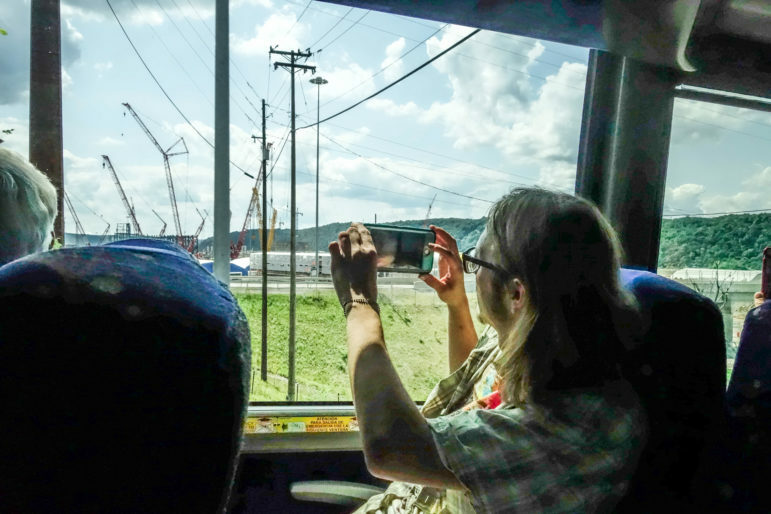 There isn’t a clear way of stopping the plant’s construction, so on the bus, the group debated whether, if they stopped the Falcon pipeline instead, they could also stop the cracker plant. “They can reroute it, but it would be a lot of time and a lot of money cost to Shell to reroute it,” Baumgardner said. “I am,” shouted Donald Johnson, a 27-year-old cook in the back of the bus. “It’s easier if you are retired,” Popovich joked, playing to the mostly older passengers on the bus. Johnson pressed his phone against the window as they approached the plant. As the bus passed, a mound of dirt obscured the passengers’ most direct view. Gary McMillan, who used to design and build homes that used solar energy, had been diligently taking notes on a small pad for his future climate change talks. But he has trouble arguing with his neighbor back in Pittsburgh, who works at the plant. “Like everyone else, he is trying to get by in life, and it’s a good union job,” McMillan said. The bus took another swing past the cracker plant, but it looked like an ordinary construction site—perhaps with a few more cranes than usual. 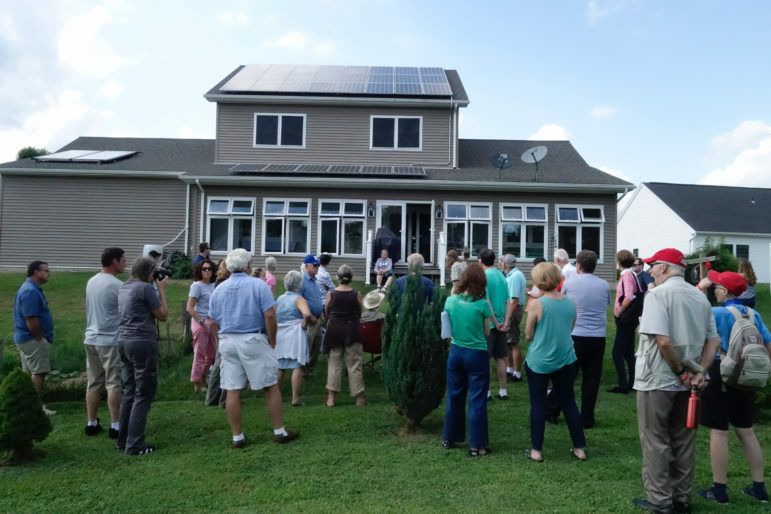 After a final stop at a Monaca home covered with enough solar panels to provide 100 percent of its energy, Johnson felt inspired. The house only cost $135 per square foot to build, and he was hopeful that many more like it could be built in the future. Al Gore’s slideshow presentations are known for finishing with inspirational stories and hope. The technique seemed to work for this trip, as well. Across the aisle, Jason Hallmark nodded. Three months ago, Hallmark had been diagnosed with multiple sclerosis at 30. Because of a lesion on his spine, his doctors said his body will eventually decline. So, he immediately bought tickets to Colorado and climbed a mountain before he couldn’t anymore. When he returned, he joined two climate change groups. It was something he had always meant to do, but between his job as an enrollment specialist at UPMC, his friends and life in general, he’d never gotten around to it. “Thank you for giving me purpose,” Hallmark agreed. With that, the bus turned back toward Pittsburgh.